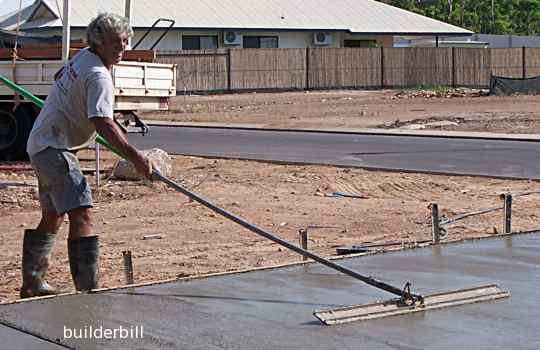 In concreting: A large wooden or metal float on a long handle used in leveling and smoothing wet concrete. The bullfloat can be used for a finish, it gives a rough sandy finish with small ridges at the edges of the strokes. 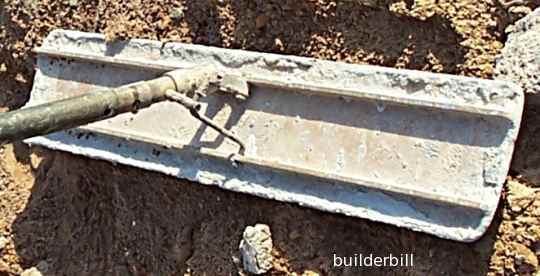 Normally though it is an intermediate tool to get the concrete level and ready for later concrete finishing. 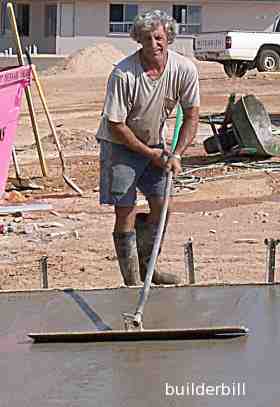 In the photo above the the concreter has raised the rear of the float and he is drawing it back to himself. At the side here he is pushing the float away from himself with the front edge raised. This float is an aluminium or magnesium alloy float that has a small link between the handle and the rear of the float that allows the user to lift or lower the edge by twisting the handle. Lifting the edge like in the photos is done when the first few strokes are made and as the surface eves out then the edge is lowered to almost flat. Here is a close up of the float itself. It is 1200 long and about 150 wide. The handle is telescopic and extends to about 5 meters. The aluminium floats are quite expensive but it is possible to do the same job using a home made wooden bullfloat as in the sketch above. Because of the fixed handle then the operator has to lift or lower the handle at each change in direction.